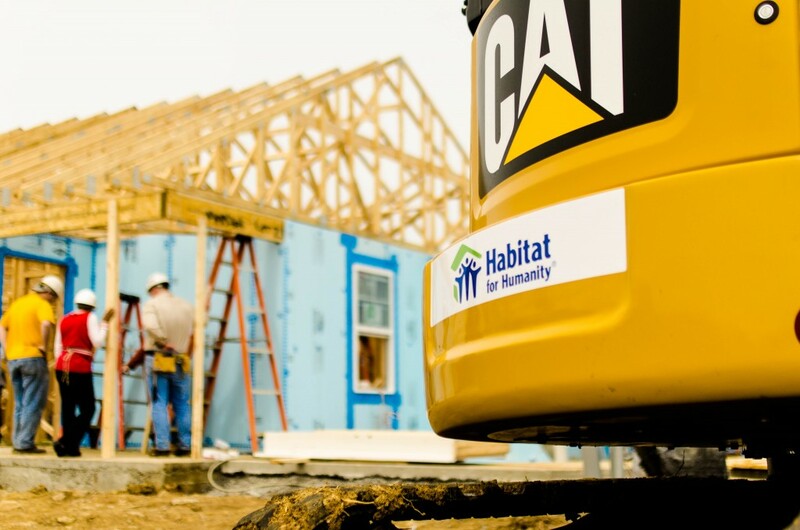 We here at Rimshot Creative are so proud to have been a part of this amazing project with Thompson Machinery and Habitat For Humanity as the website developers for http://wwwthompsoncatcommunity.com. This site served as the central hub for tracking the fund raising program and the project builds over the course of the year. We are thrilled that it was a big success. And congratulations to Eagle Reclaimed Lumber for winning the $10,000 prize. Taking down large antique structures is not an easy task. Michael and his team depend on their local Caterpillar Dealer, Thompson Machinery, to help supply earthmoving equipment to reduce the physical workload. “We’ve used Cat equipment for years, which really helps reduce the amount of time each job requires. Thompson Machinery has been great in supporting my business growth with rentals and machine maintenance programs,” said Michael. Habitat homeowners purchase their homes. To be a part of the Habitat program, each candidate must be willing to invest at least 200 hours of their time consisting primarily of 70 hours of homeownership and financial management classes, 100 hours working at the build site alongside community volunteers and donors, and 30 volunteer hours. Habitat partner families purchase their homes with a zero percent interest mortgage rate through sponsor and volunteer support and carry covenant restrictions for resell, loan defaults, and illegal activity. Additionally, mortgage payments cannot exceed 30% of the new homeowner’s income. The facts are clear: homeownership is one component to better lives. Children of homeowners are 25 percent more likely to graduate from high school, 116 percent more likely to graduate from college, and 20 percent less likely to have a teenage pregnancy. The community campaign allowed over 40 Thompson and Caterpillar Financial employees to volunteer their time during a new home build last year and fundraise over $20,000 for Habitat. 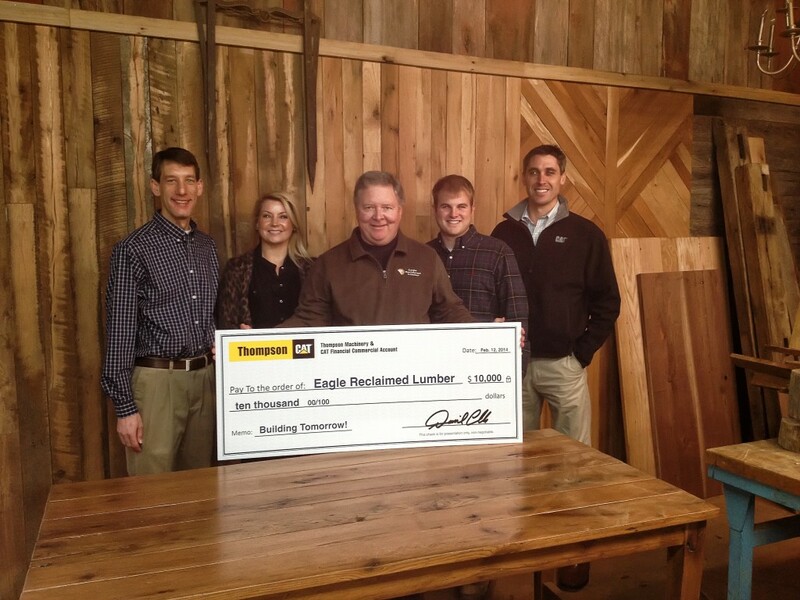 Additionally, Thompson conducted a random computerized drawing for $10,000 that included eligible customers and announced Eagle Reclaimed Lumber as the winner. Eagle Reclaimed Lumber plans to open a new showroom in Nashville later this year. For 70 years, Thompson Machinery has been committed to offering the best in equipment, as well as the most complete, most innovative, customer support services. Founded in Nashville in 1944, Thompson Machinery is the exclusive Caterpillar dealer for Middle Tennessee, West Tennessee, and North Mississippi. In addition to the complete line of Caterpillar equipment, Thompson offers agricultural equipment from Challenger, Sunflower, Lexion, Macdon, and more. Through its Cat Rental Store operations, Thompson also offers allied equipment brands such as Genie, JLG, and Sullair. Thompson Machinery serves the broad range of needs for customers in a geographically diverse territory, which encompasses construction, forestry, mining, industrial, governmental and agricultural operations. Additionally, through its Thompson Power division, the company serves trucking, marine, and power generation businesses throughout the area and beyond. With 24/7 parts and service support – including full-service branches equipped with the most up-to-date diagnostic and repair equipment, factory-trained technicians, and the area’s largest fleet of field service trucks – Thompson Machinery can be your total equipment solution provider.